When you want to programme, control, open and close valves in an irrigation installation or a distribution network, you need an element that generates and transmits the necessary electrical impulses to a solenoid valve that – in turn – controls a hydraulic valve of any size, ordering its opening and closing. That is exactly what the PRX-VALVE wireless controllers do. Via radio, with a range of 2000m, they receive commands from an IProx controller – which has a radio base station – and execute the requested operation in a matter of seconds. None of the uncertain waits of minutes or hours “until the next transmission”, characteristic of other products on the market. PRX-VALVE’s solar power allows the device to remain permanently connected and to operate for many years without having to change the batteries. Flexibility in inputs allows you to combine the control of solenoid valves with the reading of pressure sensors, water meters and soil moisture sensors in just one machine. This saves costs since it is not necessary to install various machines for different functions in the same area. For example, the PRX-VALVE can open/close two valves, transmit the signal from a pressure sensor and read a soil moisture sensor. 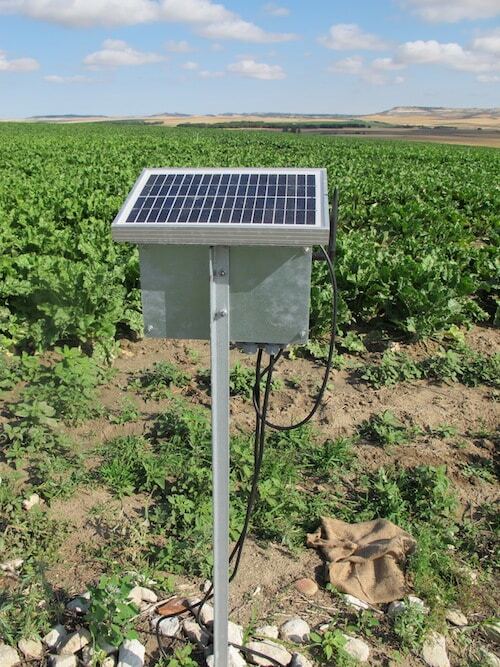 Automation and remote control of agricultural irrigation networks. Energy saving due to the incorporation of the pressure read in the sectors being irrigated in the IProx Irrigation mechanism “Continual Optimisation of Pumping Pressure”. Precision farming through the incorporation of real data regarding the soil moisture to the irrigation recommendation for each sector and crop. This helps to improve production as well as saving water and energy. An IProx controller in the pumping station (or in another location) with a radio base station. In those cultivation areas where the soil moisture or water pressure in a pipe also needs to be periodically measured, you just need to add the corresponding sensors to the PRX-VALVE solenoid valves controller. P: Can I, myself, modify in which PRX-VALVE terminals to connect a solenoid valve and in which to connect a sensor? Yes, a microswitch for each channel allows it to be easily changed. P: What are the pressure switches that can be connected to the digital inputs for? The pressure switches used are set at a fixed pressure (1 or 2 kg/cm2), as an indicator that the valve has indeed opened since pressure is detected (although it is not possible to know the exact amount, only that it exceeds the threshold to which the pressure switch is set). P: After how many years do the batteries need to be changed and what type are they? They are lead acid batteries (economic) and, if you take care to turn off the machine (using its switch) at the end of every growing season, can last for 5 years (or more). P: How many PRX-VALVE can be connected to the same radio base station? The technical limit is around 100 PRX-VALVE per base station. This amount is rarely reached on a plot with just one pumping station and IProx controller.